Located in the district of Alara, mid-way between Alanya and Manavgat, this resort-styled hotel is set in lush, spacious gardens leading down to a private beach. Enjoying a laid-back atmosphere, families will feel at home with activities for children available and the convenience of connecting rooms. A range of amenities are provided for guests' entertainment and relaxation, whether sports, animation or a relaxing Turkish bath and massage. The rooms are modern and well equipped providing a comfortable resting place at the end of the day. Public transport runs within a few metres of the complex, enabling easy access to the many wonderful historical and sight-seeing attractions such as Alanya Castle and the ancient Roman and Hellenistic ruins at Side. This comfortable hotel is situated in the heart of Karaburun, right by the hotel's own wonderful sandy beach surrounded by other hotels which fringe this beautiful Mediterranean coastline. The tourist centre and a pretty forest area are around 1 km away and Manavgat is just 28 km; the centre of Alanya is easily reached by making use of public transport. Consisting of two blocks, the luxuriously appointed rooms are decorated in soothing, muted tones with splashes of turquoise and equipped with modern amenities for guests' convenience. A host of facilities are available for entertainment and relaxation, ranging from the glorious beach to the spacious outdoor pool area and the spa centre to the games' court and hall. Ideal for families and couples, guests are sure to enjoy all that this fun complex has to offer. Featured amenities include a 24-hour front desk, laundry facilities, and an elevator (lift). Free valet parking is available onsite. Relax at the full-service spa, where you can enjoy massages, body treatments, and facials. You can soak up the sun at the private beach or enjoy other recreational amenities, which include an outdoor pool. Additional features at this inn include complimentary wireless Internet access, a television in a common area, and barbecue grills. At Perre Delta Hotel, enjoy a satisfying meal at the restaurant. Unwind at the end of the day with a drink at the bar/lounge or the poolside bar. Refurbished in 2012, this air-conditioned beach hotel comprises a main building and an annexe with a total of 273 rooms. 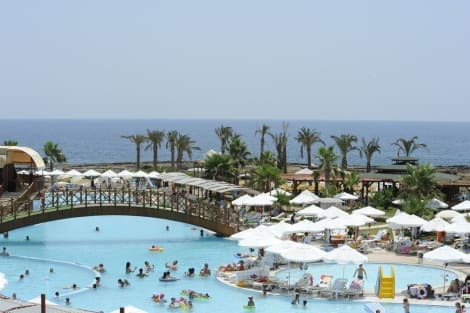 Located on the Mediterranean coast between the resorts of Side and Alanya, the family-friendly hotel has palm tree filled gardens which lead down to Karaburun Beach where guests can enjoy the hotel's private facilities. The main road is a couple of minutes' walk away where public transport and a local bazaar are available. The hotel enjoys a beachside location in the Okurcalar district which is some 32 km west from the large resort of Alanya. Public transport is available 300m from the hotel and there is a shopping bazaar 450m away. Suitable for families and couples, the hotel is set in spacious grounds with cultivated gardens. It offers a range of recreational facilities in its beachside location. The carpeted rooms are contemporarily furnished with pale, wood coloured furniture and they are equipped with air-conditioning and other amenities. The hotel has an outdoor pool, separate children's pool and a couple of waterslides which guests can use for a fun day of sunbathing. The hotel offers some light sports activities and for younger guests there is a mini club with animation in German. The hotel's SPA centre has a sauna, Turkish bath and Jacuzzi which are sure to provide a relaxing holiday. Featured amenities include complimentary wired Internet access, a 24-hour business center, and complimentary newspapers in the lobby. Planning an event in Alanya? This hotel has facilities measuring 8611 square feet (800 square meters), including a conference center. Free valet parking is available onsite. Enjoy a range of recreational amenities, including a nightclub, a steam room, and a fitness center. Additional amenities at this hotel include wireless Internet access (surcharge), an arcade/game room, and gift shops/newsstands. The family-friendly bungalow complex is located on a long sandy and shingle beach in the Okurcalar district between Side and Alanya. Local transport links are available from the main road, 50 metres from the holiday village. Nearby places of interest include Manavgat (20 minutes' drive), Side amphitheatre, museum and the Temple of Apollo (all 25 minutes by car). Antalya Airport is around 90 km away. The holiday village occupies 50,000 m2 of land and consists of 47 bungalow-type blocks from 2 to 3 floors high. The air-conditioned hotel offers 404 rooms in total and welcomes guests in a lobby with 24-hour reception and check-out service. The holiday village has an international clientele and also offers conference facilities. Further facilities include a hairdressing salon, auditorium and restaurant. The spacious rooms all come with a bathroom and fully - equipped as standard. lastminute.com has a fantastic range of hotels in Okurcalar, with everything from cheap hotels to luxurious five star accommodation available. We like to live up to our last minute name so remember you can book any one of our excellent Okurcalar hotels up until midnight and stay the same night.